Two of the vehicles sustained major damages in the incident that occurred in front of the Digicel flagship store. It is unclear what lead to the 3rd vehicle becoming involved in the accident and whether anyone was seriously hurt. 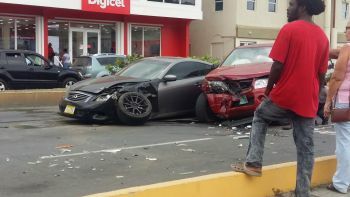 Two cars suffered a broken axle and other frontal damages while the third car received damages to the front bumper. Please be careful on the roads. Suspect that the red car may have performed a dangerous right hand 180 degree turn into the layby on the other side of the road and hit the truck. Look at the tint on the Infinite car, no wonder they couldn't see! THAT'S NO PLACE TO SPEED. A pedestrian could have been killed. How people drive is how the BVIs is. Drive like you want because there are no consequences to what you do. When you crash, it’s the other people’s fault, or bad roads, or the hurricanes.